Our annual banquet and raffle is a chance to learn more about our organization, where your money goes as a member, and to support local organizations and causes. 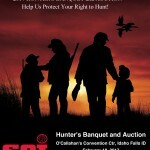 Additionally, great prizes and opportunity are abound as we gather to celebrate the Idaho Chapter of SCI. All banquet tickets, early-bird packs, credit card receipts, and bidding paddles will be distributed at the door on the night of the banquet. Your order will be confirmed either by email or postcard, so please complete the contact information correctly. Your ticket package will include one “bidding paddle” per couple. The Chapter has adopted this procedure to speed up the banquet checkout line. Any other member of your party who wishes to bid on items may pick up a bidding paddle at the banquet table.